In case you missed it, the Federal Reserve bowed to the will of the stock market in its announcement on Wednesday and indicated no further rate hikes this year. And for good measure, they also indicated that no more than one hike was likely next year and that they were going to slow down on their quantitative tightening (i.e. letting the Fed’s massive balance sheet run off). The market enjoyed a mild bounce on the announcement, though it was short lived. While a more accommodative Fed is “good” for stocks, it also implies that prospects for growth and profits aren’t particularly strong. The far more interesting story for me in my income-generating neck of the woods is what’s happening in the bond market these days. 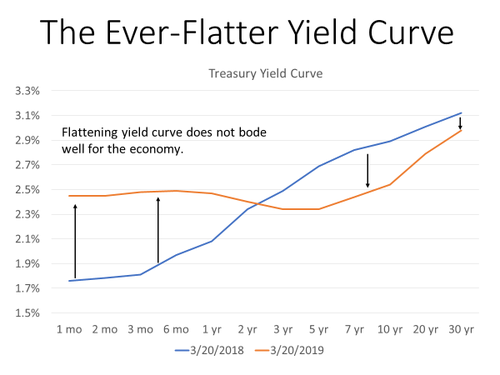 Over the past year, the yield curve has twisted and flattened, with short-term rates rising and long-term rates falling. In a healthy economy, you expect to see an upward-sloping yield curve like we did a year ago (blue line). Today’s yield curve is flattish and actually bows in the middle, making it partially inverted. (An “inverted” yield curve is where longer-term rates are lower than shorter-term rates.) The bond market has been at least partly inverted since early December. Historically, an inverted yield curve has been an early warning sign of a pending recession within the following two years. Now, not all yield-curve inversions are the same. Economists tend to focus more on the longer-end (10 to 30 years) and specifically the relationship between the 2-year yield and the 10-year yield. These parts of the curve haven’t inverted, or at least haven’t inverted yet. All this same, this doesn’t exactly point to a rip-roaring economy going forward. As I’m writing this today, the 10-year Treasury yield has dropped to just 2.51%, while the 2-year Treasury yield is just 2.40%. We’re just a 0.11% move away from the kind of yield-curve inversion that keeps economists awake at night. Yield curve inversion is one of the most accurate predictors of recessions you’re ever likely to find. Literally every recession since World War II has been preceded by an inverting of the yield curve, and there was only been one false positive (the curve inverted in late 1966 but there was no recession that followed). Now, there are legitimate reasons to think that “this time is different.” With the Fed active at both ends of the yield curve, you can argue that the bond market is so distorted right now that it’s impossible to draw meaningful conclusions. Hey, I understand the sentiment. But it’s still likely wrong. Everyone always believes “this time is different,” but it almost never is. And there’s a lot of reasons to believe a recession could be here sooner than most people think. U.S. unemployment is now at generational lows and can’t realistically go much lower from here. Unemployment hits bottom near the end of economic expansions, and, in fact, a tight labor market is a factor that causes recessions as a tight labor market tends to cause inflation. Inflation leads to higher borrowing costs, which leads to lower profits. Meanwhile, high prices have led to a slowdown in the housing market… and bad debts are at record highs in the auto sector. And many of our trading partners, particularly in Europe, have seen growth grind to a halt. None of this suggests robust growth is around the corner, yet U.S. stocks are trading at their highest valuations since the dot-com bubble. I don’t know about you, but I’m not particularly keen on adding new money to an index fund at these prices. And that’s fine. No one says we have to. In Peak Income, I’ve been looking for income plays that are a little out of the mainstream stock market. Most of my recommendations sport dividend yields of 5% to 10% and offer the potential for capital gains well in excess of that. Click here to find out more, and start preparing for what’s to come today.